“She gave me goosebumps to be honest. I had never ridden her in the afternoon,” said Smith, who teamed with Baffert for their third graded stakes win of the Saratoga meet, joining Marley’s Freedom in the Grade 1 Ketel One Ballerina and Abel Tasman in the Grade 1 Personal Ensign. “I was fortunate enough to work her one morning, so I knew she was really talented, but I didn’t realize she was this talented. 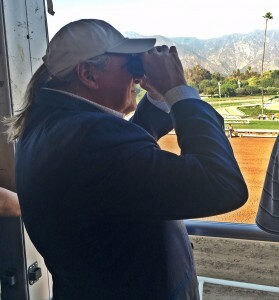 “Man, she brought it today,” Baffert said by phone. “She had been training so well and we were debating on running her here [at Del Mar] in a stake on closing day or take her to Saratoga. She decided to give her a shot since she was doing so well. I’m just glad she shipped well and is still undefeated. That freshening really helped her. She’s really matured a lot. She showed today how good she really is. It’s pretty exciting. “My 100th stakes win at Del Mar. Wow. I hope I can get number 101 a little later (he rides Majestic Eagle in the Del Mar Derby).